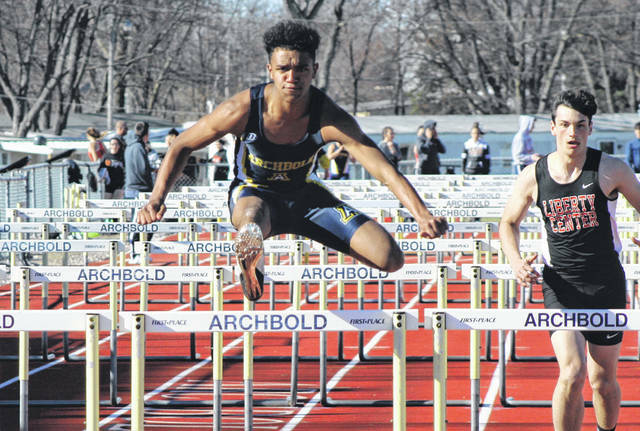 Antonio Cruz of Archbold clears the last hurdle in the boys 110 meter hurdles during a NWOAL tri-meet with Liberty Center and Delta Tuesday. He placed first in this event with a time of 17.6. Delta’s Cassandra Lee, right, hands off to Samantha Maurer in the girls 4x100 meter relay. The Panthers were victorious in this event. Iris Pena of Archbold, right, hands to Gwynne Riley in the 4x200 meter relay. The Blue Streak girls won every relay except for the 4x100. 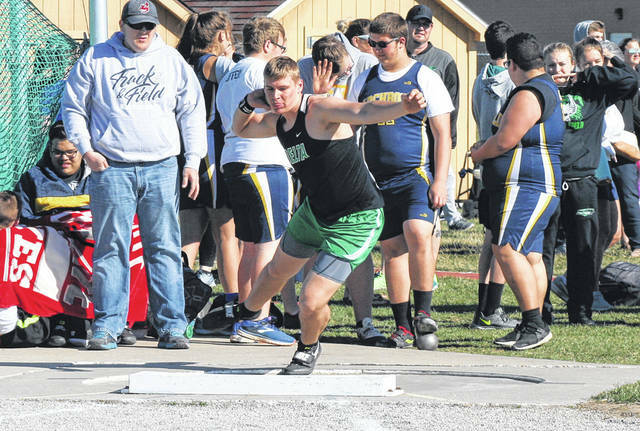 Hunter Tresnan-Reighard of Delta in his wind up before a throw in the shot put during Tuesday’s meet at Archbold. He won both the shot put and discus for the Panthers. 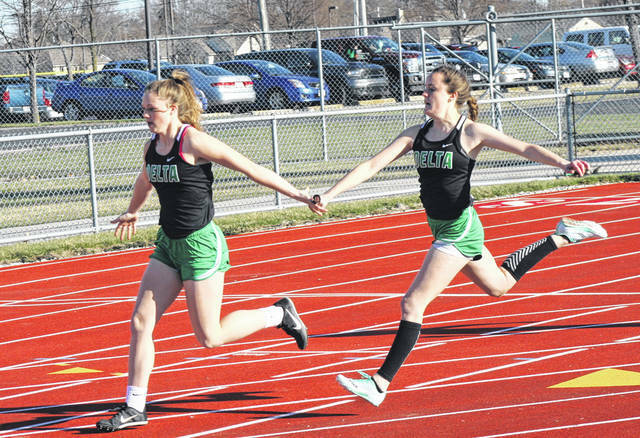 Archbold and Delta finished second and third respectively to Liberty Center at a Northwest Ohio Athletic League track and field tri-meet held in Archbold Tuesday. In the boys meet Liberty Center won with 74 points. Archbold finished with 71 points and Delta 30. The Liberty Center girls won with 87 points, Archbold took second with 50, and Delta third at 32. Leading the Blue Streak boys was Elijah Zimmerman who took home individual titles in the high jump and long jump. Other winners for the Streaks were Antonio Cruz in the 110 meter hurdles, L.J. Tijerina (100m), and Trey Theobald (200m). 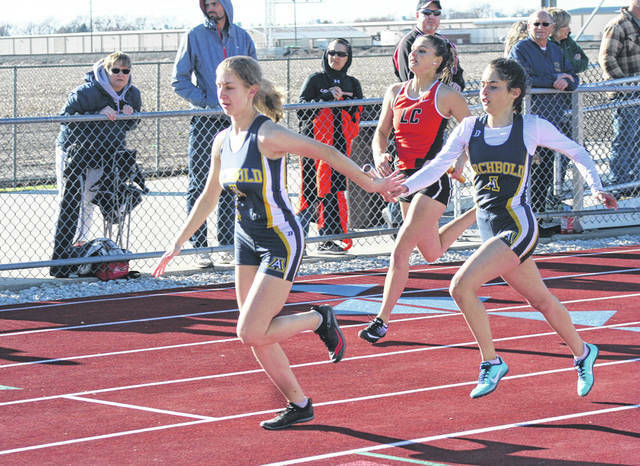 Archbold had winning relay teams in the 4×100, 4×200 and 4×400 meter relay events. Delta’s Hunter Tresnan-Reighard won the shot put and discus for the Panthers. They also got a title from Blake Schauwecker in the 400m. In the girls meet, the Streaks garnered titles from Dakota Stamm in the 300m hurdles and Shylo Richardson in the long jump. Archbold went four for four in relay events as well. Winning for the Panthers were Cassandra Lee in the 400m and Ella Ford in the high jump. 4×800- Liberty Center (Connor Keller, Starkey, Manny Keller, Miles), 9:37.1; 110 hurdles- Cruz (A), 17.6; 100- Tijerina (A), 11.7; 4×200- Archbold (Cruz, Gomez, Theobald, Grime), 1:39.2; 1600- Rauch (L), 4:55.4; 4×100- Archbold (Cruz, Gomez, Grime, Tijerina), 47.7; 400- Schauwecker (D), 54.9; 300 hurdles- Connor Keller (L), 44.6; 800- Starkey (L), 2:22.8; 200- Theobald (A), 24.1; 3200- Elieff (L), 10:42.5; 4×400- Archbold (Grime, Beaverson, Roth, Theobald), 3:44.5; High jump- Zimmerman (A), 5-8; Long jump- Zimmerman (A), 20-2.75; Vault- Garretson (L), 11-0; Shot- Tresnan-Reighard (D), 48-9; Discus- Tresnan-Reighard (D), 157-3. 4×800- Archbold (Riley, Regan Ramirez, Montana Stamm, Karley Ramirez), 11:12.3; 100 hurdles- Bachman (L), 15.9; 100- Hollenbaugh (L), 13.5; 4×200- Archbold (Brittney Ramirez, Pena, Riley, Dakota Stamm), 1:54.9; 1600- Oelkrug (L), 6:00.3; 4×100- Delta (Lee, Maurer, Ford, Wyse), 59.4; 400- Lee (D), 1:09.7; 300 hurdles- Dakota Stamm (A), 51.6; 800- Atkinson (L), 2:29.7; 200- Mohler (L), 28.0; 3200- Miller (L), 13:04; 4×400- Archbold (Brittney Ramirez, Riley, Pena, Dakota Stamm), 4:14.9; High jump- Ford (D), 5-0; Long jump- Richardson (A), 15-10.5; Vault- Long (L), 8-0; Shot- Heath (L), 32-9.75; Discus- Heath (L), 96-1. Delta’s Cassandra Lee, right, hands off to Samantha Maurer in the girls 4×100 meter relay. The Panthers were victorious in this event. Iris Pena of Archbold, right, hands to Gwynne Riley in the 4×200 meter relay. The Blue Streak girls won every relay except for the 4×100.